Any body don this? I bought a garmin for a back up to my POS Raymarine Hybrid Touch. I'd rather NOT drill another hole in the bottom. make sure the two transducers don't have conflicting frequencies or neither will work at the same time. you can toggle the frequencies in setup to juggle this. you can buy a piece of starboard and screw it on the transom and attach multiple transducers to the starboard. this allows you to mess around a little with location and height without screwing multiple holes. or you might want to try this. super strong glue means no holes in the transom but it also never comes off. Search my recent post for Sidescan xducer mount for pix. I used a Sternmate...thumbs up! I'll second the Sternmate. Made a huge difference for me. I attached a piece of 5/4 real mahogany - much more dense and rot resistant than the typical "mahogany" - to my transom using 5200, after sanding the area to remove all bottom paint and rough up the fiberglass. Used the engines and wedges to compress the mahogany while the 5200 was setting up. Then I screwed the tducer to the mahogany and applied bottom paint to the wood. It's been on for 3 years and is solid as a rock. No holes in the transom! I recently replaced 2 transducers on the transom of a GW228 Seafarer. Had to fill existing screw holes with polyester epoxy mixed w/ ground glass and top w/ gel coat. I used the Stern Pad Jumbo to mount a new Garmin sidescan transducer. The Stern Pad block uses a 3M self stick adhesive pad that is rated for underwater applications. That way you do not have to drill any holes into transom. The kit also comes with the self stick cable tie downs, to eliminate more screw holes. I also put a bead of silicone calk around the pad for extra holding power. You could mount the pad sideways for more Xducers. Happy with results. I suppose a lot of this (attachment method) comes down to personal preference, experience and skill set. Personally (my preference) I l've always just drilled holes. As long as you do that properly, there is no chance of water intrusion. Or, at least, in the three decades that I've been doing it that way, everything has been OK (knocking on wood). I will say that I'm a little leary of a "peel-n-stick" solution for long-term - but that's just me. The HDPE/5200 solution I would imagine is a little more sturdy, even though 5200 doesn't stick extremely well to HDPE. But drilling blind holes in the backside of the HDPE can provide more surface area for adhesion, as well with adding to the mechanical adhesion as opposed to just chemical. yeah i am still in favour of screwing a starboard board and then mounting. drill a pilot hole, fill the hole with 4200 and also coat the screw. pretty unlikely it will leak. that ebay listing is using 3m vhb tape which is ordinary double sided foam tape you can buy inexpensively at hardware stores. not sure how durable that would be, it will come off with a hot putty knife. the second one i linked to uses some kind of epoxy and has concave indents in the back. too good i think. you will never get it off. I will say, though, that if that TRULY is 3M vhb... that is very good stuff. It's definitely not the normal double-sided stuff. Doesn't change my mind, though. I wouldn't feel comfortable trusting it for the long haul in this application - especially with a larger, heavier ducer. But, hey, that's why we have opinions! Sternmate has 3M VHB and it was on all season under water. Obviously, there is a prep that has to be done. 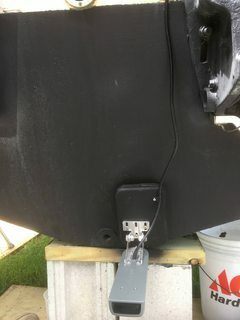 I removed the old through-hull transducer and installed the structure scan in its place, it’s at the centre of the keel so perfect, the sonar transducer is installed as a shoot-through and is excellent.....no additional holes for me. Thanks for all the tips. Skunk, you have that between the two motors? It doesn't send air down to the prop on plane ? Like you I researched the best placement and the consensus was between the motors. It doesn't read well on plane but that might get better with an adjustment in angle. Sidescan works GREAT for finding and "seeing" wrecks. I have an older Garmin with Airmar thru hull that works great on plane.